Robson Ranch residents Andy and Kathleen Hockett enjoyed a wonderful trip to Alaska to visit with their close friends the Brozeks and Gayers, also Robson residents who depart in the summer for their homes up north. Andy organized his first long-distance fishing trip with California friends and neighbors Bill Behan of Brentwood, Bill’s son, Kevin, of Sonoma and Bob Rumberger of Discovery Bay. The group landed in Anchorage on 7/19. Kathleen went to stay with Judy and Bob at their place downtown for a few days. The guys headed for the Kenai Peninsula to begin their stay at Barbara and Tom Gayer’s Eagle Landing Resort in Cooper Landing, one of the top fishing areas in Alaska, on the Kenai River. Kathleen and Judy shopped, played golf and sipped wine at some of Brozek’s favorite restaurants. After three days they headed for Judy’s son’s cabin in the ski resort at Girdwood. Kathleen exclaimed, “At every turn I saw majestic, snow-capped mountains, amazing glaciers, every color of green foliage from the tree laden hillsides, soaring eagles and wildlife. Our weather was so good, we even saw Mt. McKinley peaks from downtown!” Barb Gayer joined the girls in Girdwood for an overnight stay with more dining out, lots of laughs and game playing. Kathleen and Barb returned to Eagle Landing for the last two days of Hocketts’ vacation. By then the men had experienced rainbow trout fishing, a boat trip from Seward along the coast to view glaciers up close, migrating dolphins, whales and other wildlife. They also visited Homer, and Kathleen joined the group for lunch in Whittier. We had the best farewell dinner with fresh salmon at Gayer’s cabin, created by our own private chef, Kevin Behan. 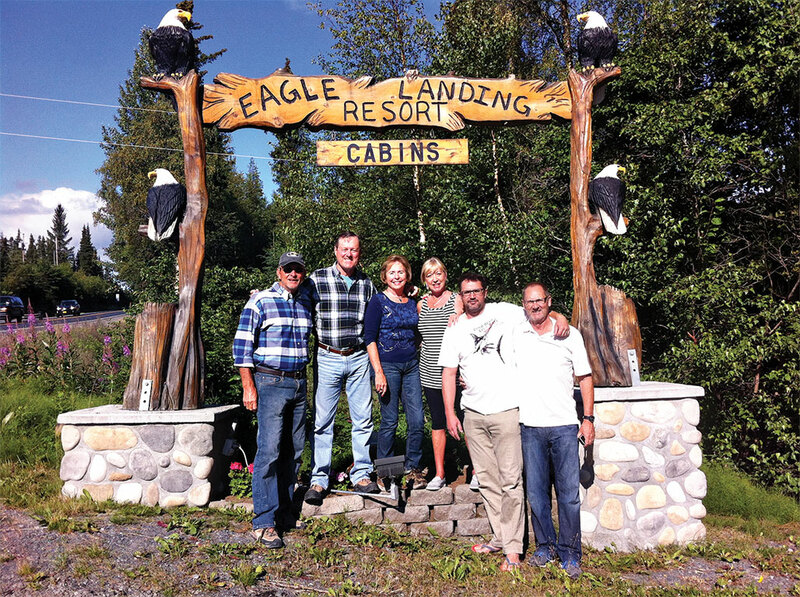 The Eagle Landing Resort is an incredible “piece of heaven” in the Alaska wilderness located on a beautiful river with sprawling lawn between log cabins. We had endless daylight, amazing sunsets, hit golf balls off the deck at midnight, enjoyed horseshoe tournaments and finished the day around the huge fire pit sharing stories. Our RR Alaskan residents know how to entertain their guests in style! We have travelled worldwide, but nothing surpasses the breathtaking sights we saw in our very own Frontier State, an excellent trip was enjoyed by all.